DOT Desk: Bangladesh got this award among 16 categories where contestants from 52 countries participated in this competition, reports Dhaka Tribune. 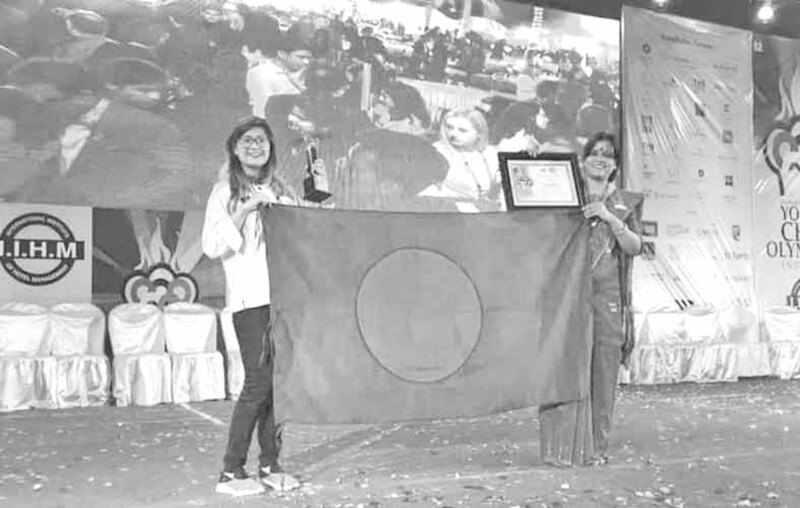 Aqsa Iqbal, the a culinary participant from the National Hotel and Tourism Training Institute (NHTTI) of the Bangladesh Parjatan Corporation (BPC), has won the “Welcome Skills Special Achievement Award” in a global learners’ competition “Young Chef Olympiad 2019” held in three cities Delhi, Pune and Kolkata of India, according to a press release issued recently. Bangladesh got this award among 16 categories where contestants from 52 countries participated in this competition. Young Chef Olympiad took place for the fifth time this year which is organised by International Institute of Hotel Management (IIHM) as part of IndiSmart Group, a large conglomerate that operates IndiSmart Hotels. The primary aim of the event is creating an international platform for the interaction of young professional culinary talents from around the world and to display the creative and innovative aspects of developing the profile of chefs from around the world, Jaheda Begum, head of Food and Beverage Production of the National Hotel and Tourism Training Institute and deputy manager of BPC told media. NHTTI, the lone national and largest hotel management institute in Bangladesh which started its operation from 1974 under the BPC has been contributing a lot to the tourism and culinary industry and so far nearly 50,000 trainees have been graduated on hotel and tourism from this institute, she added. Just before the ending ceremony, YCO arranged a National Dish Display in Kolkata, where Bangladesh displayed an authentic and traditional Bangladeshi dessert namely “Khola Jali Pitha” mainly originated and practiced in some regions of Chittagong, Noakhali and Cumilla districts. The dish was served with roasted duck. This Pitha received rave reviews from other contestant teams from 52 countries. Suborno Bose, chairman of YCO global council, as well as co-chairman, International Hospitality Council, and Founder of IndiSmart Group, is the central man behind this world’s largest culinary show by the young learners. Bose is very much keen to help Bangladesh Tourism and hospitality training to grow. It is expected that he will tour Bangladesh to sit with Chairman, BPC and the tourism stakeholders soon. BPC is working to get better success in the next Olympiad, Zaheda added.